The Global Volcanism Program has no activity reports for Antisana. The Global Volcanism Program has no Weekly Reports available for Antisana. The Global Volcanism Program has no Bulletin Reports available for Antisana. Antisana is a massive, glacier-covered stratovolcano NE of Cotopaxi, along the western margin of the Cordillera Real, 50 km SE of Quito. An older edifice forming the east side of the volcano was constructed over granitic and metasedimentary rocks and is itself overtopped on its NW side by the modern edifice. Two small calderas, one breached to the south and the other to the NE, truncate the older edifice. Viscous, youthful block lava flows have issued from radial fissures on the flanks of 5753-m-high Antisana, one of the highest peaks in Ecuador. The only unequivocal historical eruption took place from 1801 to 1802, when a lava flow was erupted from a vent NNE of the summit. Eighteenth-century eruptions occurred SW of Antisana, in the Chacana caldera. Barragan R, Geist D, Hall M, Larson P, Kurz M, 1998. Subduction controls on the compositions of lavas from the Ecuadorian Andes. Earth Planet Sci Lett, 154: 153-166. Bourdon E, Eissen J-P, Monzier M, Robin C, Martin H, Cotten J, Hall M L, 2002. Adakite-like lavas from Antisana volcano (Ecuador): evidence for slab metasomatism beneath the Andean Northern Volcanic Zone. J Petr, 43: 199-217. There is no Deformation History data available for Antisana. There is no Emissions History data available for Antisana. The floor of the massive Chacana caldera is seen here in the foreground, looking SE with glacier-covered Antisana volcano in the distance. Chacana is a 32 x 24 km caldera complex of Pliocene-Holocene age. Its outer flanks extend over 50 km, making it one of the largest rhyolitic centers of the northern Andes. Numerous lava domes were constructed within the caldera, which has been the source of frequent Holocene explosive eruptions. Dacitic lava flows were erupted during the 18th century and numerous hot springs are found on the caldera floor. 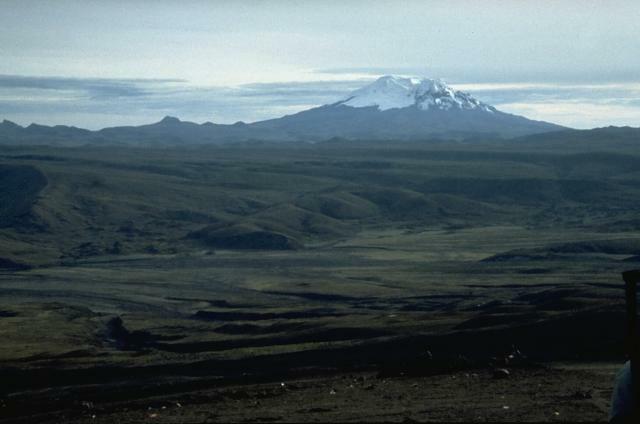 Massive, 5753-m-high Antisana volcano is seen here from its SW on the northern flank of Cotopaxi volcano. The glacier-clad Antisana was constructed immediately SE of Chacana caldera, the largest rhyolitic center of the northern Andes, which lies beyond the jagged ridge left of Antisana. 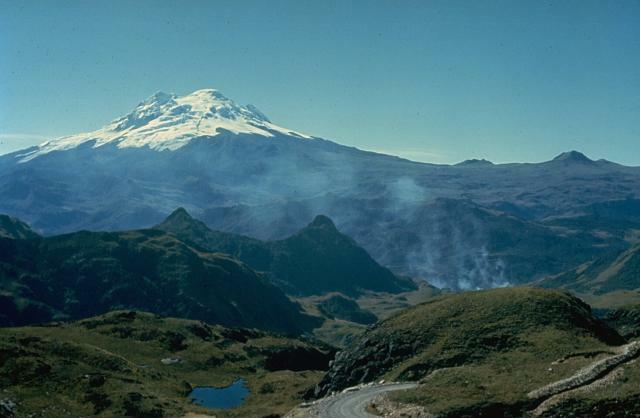 The only unequivocal historical eruption of Antisana occurred in 1801-02 from a vent NNE of the summit. Photo by John Ewert, 1992 (U.S. Geological Survey). 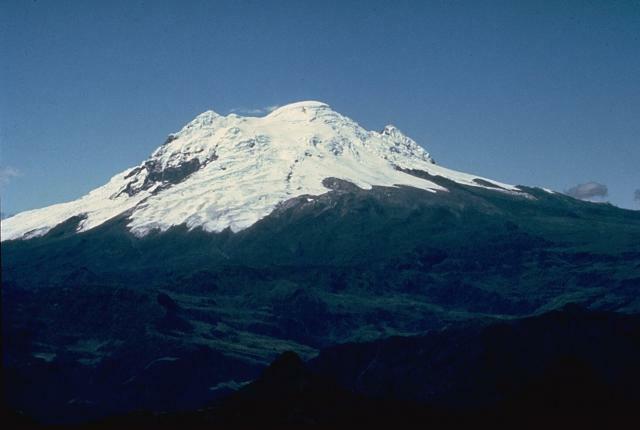 Antisana is a massive, glacier-covered stratovolcano NE of Cotopaxi. The 1.4 x 1.8 km summit crater, seen here from the north, is breached to the SE. Viscous, youthful block lava flows have issued from radial fissures on the flanks of 5753-m-high Antisana. The only unequivocal historical eruption took place from 1801 to 1802. Eighteenth-century eruptions occurred NW of Antisana within Chacana caldera, which lies beneath the cloud bank in the foreground. 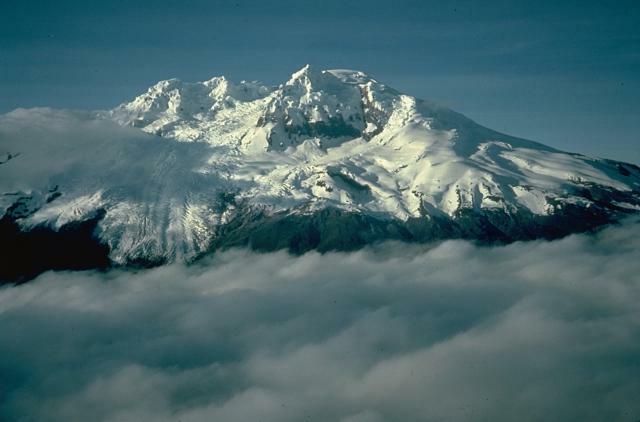 Antisana volcano is one of four massive glacier-covered stratovolcanoes constructed along a N-S line at the western edge of Ecuador's Cordillera Real. Its summit crater is breached to the SE, behind the summit in this view from the NW. Its only unequivocal historical eruption produced a lava flow from a NNE-flank vent at the beginning of the 19th century. Photo by Minard Hall, 1979 (Escuela Politécnica Nacional, Quito). There are no samples for Antisana in the Smithsonian's NMNH Department of Mineral Sciences Rock and Ore collection. Large Eruptions of Antisana Information about large Quaternary eruptions (VEI >= 4) is cataloged in the Large Magnitude Explosive Volcanic Eruptions (LaMEVE) database of the Volcano Global Risk Identification and Analysis Project (VOGRIPA).